"Psyched for the Full-Rip Nine"
Is the Pacific Northwest ready for a megaquake? Link via Craig Newmark. The presence of an attractive woman elevates testosterone levels and physical risk taking in young men, according to a recent study in the inaugural issue of Social Psychological and Personality Science (published by SAGE). Recent online articles discuss research that suggests moderate drinking of beer may help prevent prostate cancer. The key chemical is called "xanthohumol" which is found in hops. Xanthohumol has been shown to limit the actions of estrogen and may help prevent breast cancer. The article says that since estrogen and testosterone work in similar ways, the chemical may help fight against prostrate cancer. Another recent study says that beer is a good source of dietary silicon, something that helps prevent against weak bones. Beers made with malted barley rather than with other brewing malts like wheat and corn are more likely to contain this dietary silicon which could help with keeping bones from becoming weak. Most beer styles that you will find out at your local store are made mainly with a type of malted barley, often 2-row malt (common in many ales and stouts) and pilsen malt (common in pilsner beers, which count beers like Budweiser in their family). The article also note that beers rich in hops also have high levels of dietary silicon. So beers like IPA's which are beers historically brewed in Britain and shipped to the queen's soldiers in India. This was in the days before the Suez canal and refrigerated transport, so vast amounts of hops were used as a preservative on the long trip around the tip of Africa. John Palmer, writing on the dietary silicon article, rightly notes that the expected effect is small and has a negative second derivative. In other words, too much drinking is bad for your health. He also doesn't attach much significance to it. This may be an insignificant result, but you can say a similar sort of thing about most any study on most any subject. Each study is a chip off the frontier of knowledge, if you will, and it's tough to make definitive statements about any one study. But knowledge advances study by study. We might not want to judge a particular chip off the wall as being important, but let's look at the pile of rubble. Personally, I have obtained a taste for IPA's, particularly IPA's brewed in cities like Boulder and Longmont, Co., along the Front Range of the Rockies. My favorites are Avery's IPA, Avery's Maharaja, Boulder's Mojo, and Boulder's Mojo Risin.' I also like the Single and Doublewide IPA's brewed by the folks at Boulevard Brewing in Kansas City which has a flavor and mouthfeel similar to the Front Rage brews. In my homebrewing, the last few 5 gallon batches I have made have been hoppy ales and pilsners. I've brewed a couple of Cascade Pale Ales, a couple of Hop Head IPA's, a couple of pilsners, and a new beer I call Front Range IPA. The latter beer tastes similar to Avery's IPA and Boulder's Mojo, thus the name. All my beers are malty (the Hop Head uses 15 pounds of 2-row malt and the Cascade and IPA use 10 pounds each). Each of those ales contain a lot of hops. The question I have is this: do I have a taste for hoppy beers just because I like them, or is my body sending me signals that, all else equal, I have things inside me that could make susceptible to prostate cancer, weak bones, or something else . In other words, is my taste for malty, hoppy beers one of the ways my body defends itself? While we wait for an answer to that question, Bottoms up! A 35-mile rift in the desert of Ethiopia will likely become a new ocean eventually, researchers now confirm. The crack, 20 feet wide in spots, opened in 2005 and some geologists believed then that it would spawn a new ocean. But that view was controversial, and the rift had not been well studied. A new study involving an international team of scientists and reported in the journal Geophysical Research Letters finds the processes creating the rift are nearly identical to what goes on at the bottom of oceans, further indication a sea is in the region's future. Here's a Science Daily news release on the new rift. Here's a post on the subject at Scientific Blogging. Climate debate daily: both sides of the global warming debate. HT to Dave at VoluntaryXchange. Right about now, I'd like a little local warming. From Live Science. Beer, LSD, getting pissed off, and maggots make the list - in moderation of course. 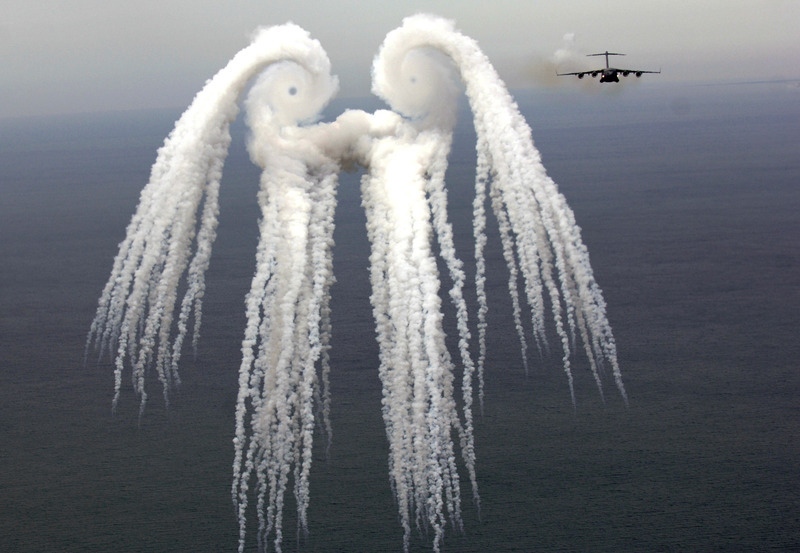 From the always-excellent Astronomy Picture of the Day comes this picture of a smoke angel. That's too dadgummed spooky lookin' to be an angel. Scientists have found evidence of rivers and lakes below the icy surface of a body in our solar system. No, not that icy body. Nor that icy body. This icy body. Rivers as big as the Thames in England that may connect sub-glacial lakes have been found deep under the Antarctic ice, scientists said on Wednesday.